My review of Chris Butler’s book on Lefebvre, which I posted here earlier, has just come out in Society and Space‘s reviews online. Speedy turnaround for anyone looking to do reviews! This is an excellent book that will no doubt take up a place in the canon of secondary texts on Lefebvre alongside works by people like Rob Shields, Andy Merrifield, Stuart Elden, and Lukasz Stanek. The book is well written and concise. The argument never sprawls, but Butler also never leaves the reader (at least those familiar with Lefebvre) feeling like something vital was left out of the discussion. The scholarship in the book is also quite impressive. Butler has clearly read widely in Lefebvre’s vast corpus, and his analysis focuses mostly on Lefebvre’s own work, drawing in secondary sources only sparingly. I think this is precisely the way one should do a book like this: engage predominantly with the writings of the author in question, and make use of secondary sources only where they can add some specific value. The book’s concision and careful scholarship are all the more impressive when dealing with a thinker like Lefebvre, whose work is so voluminous and ranges across so many different substantive topics. On top of these evident strengths, Butler also reads Lefebvre in just the right way (in my opinion). That is, he understands Lefebvre’s work to be primarily an exploration of the possibility of radical politics. Lefebvre’s whole project is animated by a deeply felt normative political spirit. He analyzes the structures of power, to be sure, but only in order to seek out and learn to recognize the oppositional, or, better, alternative forms of life that are emerging all around us. In a sentence, Lefebvre hopes that a thoroughgoing political awakening among urban inhabitants will give rise to a generalized self-management (autogestion) of space, and that this generalized autogestion will move us entirely beyond the current regime of State command and capitalist social relations. Let me try to expand a bit on that sentence in a way that is true to Butler’s arguments about Lefebvre. Butler begins by establishing Lefebvre’s commitment to an open Marxism that rejects reductionism and economism. He suggests (e.g. p. 43, 142) that Lefebvre’s interest in both space and everyday life were, at least in part, a way for him to think through how politics and action could extend beyond the shop floor and into every aspect of our lives. Lefebvre always remained deeply committed to Marxism as a political project, but as Butler makes clear, Lefebvre’s Marxism is particularly shaded toward the work of the young Marx, especially “On the Jewish Question” and “Economic and Philosophical Manuscripts.” In OJQ, Lefebvre reads a decisive argument for a complete rejection of the State, and this leads him to declare dead-on-arrival the old model of revolution in which a workers’ party seizes the State and abolishes private property (Butler, p. 113). From EPM Lefebvre takes an analysis of alienation and appropriation that colors almost all his thinking. For example, Lefebvre was concerned that urban space in contemporary cities is alienated from its users because it is produced for them by expert managers. He argues that inhabitants must re-appropriate urban space through a process of political mobilization that struggles for grassroots control of the production of urban space. Only through autogestion can the members of a free association take control over their own life, in such a way that it becomes their work [oeuvre]. This is called appropriation, de-alienation (Lefebvre, State, Space, World, p. 150). Here we have the essence of Lefebvre’s political values. He typically offers an extended analysis of the powers that be, but he does so only in order to discover what counter-powers might be at work, what non-alienated powers we possess, and what worlds we might be capable of creating instead. Thus in The Production of Space he discusses at length the way abstract space constrains and dominates us, but he does so in order to sketch the lineaments of differential space, a space that runs counter to and beyond abstract space. Differential space is currently inchoate, but it is nevertheless already emerging. Similarly, in The Urban Revolution, Lefebvre gives us a meticulous critique of the industrial city, a city managed by the State-and-capital that works to ensure capital accumulation by homogenizing space, segregating users, and reducing them to passive consumers rather than active political agents. Again, he offers this critique in order to enable us to see what is counter to and beyond the industrial city, a possible world Lefebvre calls urban society, which is, like differential space, inchoate but already emerging in the cracks of the present order. It is in the context of this distinction between the industrial city and urban society (and, more generally, the distinction between abstract space and differential space) that Butler quite rightly reads Lefebvre’s idea of the right to the city. As Butler laments, overuse of the concept among academics and activists has led to its pretty-near-total devaluation, so that anyone at all who is doing anything even vaguely political in a city is said to be claiming their “right to the city.” But for Lefebvre, the right to the city is part of this more general political awakening whose goal is a generalized spatial autogestion. 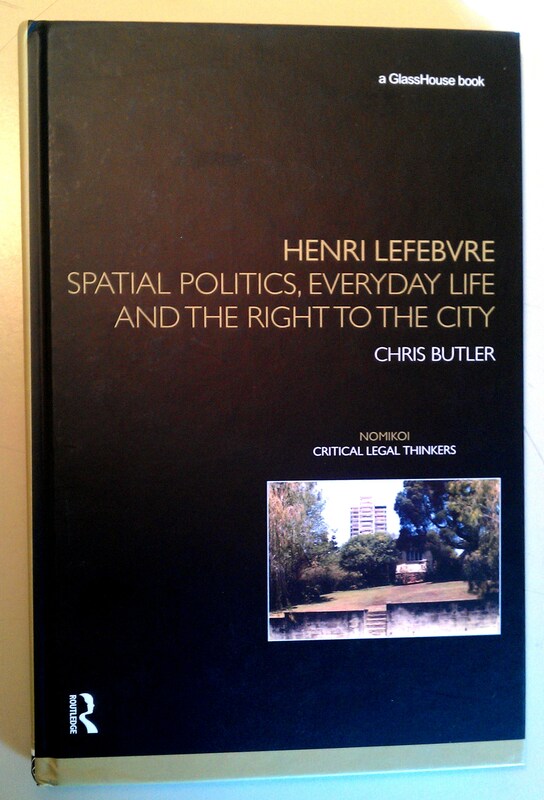 For Lefebvre the right to the city “is like a cry and a demand” through which inhabitants declare their intention to begin a struggle to manage the production of urban space themselves, without the State and without capital. It is the most radical of political visions, one that is deeply Marxist in its rejection of capitalism and also deeply anarchist in its clear-eyed resolve to struggle against the State and its management of space. Because the right to the city necessarily implies spatial autogestion, it can never be content with management of space by State representatives on behalf of inhabitants. He stresses unequivocally that inhabitants will manage space for themselves. This way to conceive of the right to the city, of course, is almost wholly incompatible with contemporary efforts (and there are many) to create a right to the city understood as a positivist legal right guaranteed by the State. While Butler is appropriately respectful of these efforts and restrained in his disapproval, he is also right to emphasize that such efforts depart profoundly from Lefebvre’s political vision. Let me mention one last important point Butler raises, which is his insistence on attention to Lefebvre’s idea of the right to difference. Butler argues that the right to the city is not enough because it can lead in practice to a kind of undesirable localism (p. 150), and that it must be partnered with a claim for a right to difference. Here I agree with Butler that we should pay more attention to this relatively under-emphasized theme (difference) in Lefebvre’s work. However, I disagree that the right to difference should be seen as a way to complete a lack in the idea of the right to the city. Instead, I understand the right to difference to be mostly just another way to articulate what is already implied in the right to the city and its project of spatial autogestion. That is, I read the right to difference as the right to think and act in a way that is different from the homogenizing forces of the industrial city and abstract space. Or, put another way, the right to difference is the right of inhabitants to encounter each other on their own terms and engage together in the project of managing urban space for themselves. Both rights are fully intertwined for Lefebvre, each presupposes and necessitates the other. That said, I fully share Butler’s desire for more attention to the idea of the right to difference, and more debate about how it relates to the (fully Lefebvrian) idea of the right to the city. All in all, this is a tremendous book, well worth reading for those interested in Lefebvre, and for anyone committed to developing a radically new vision for left politics, for cities, and for the production of space.